Hey I’m Davis! I’ve been a reader of 918 Plate since the beginning and a friend of Hillary for even longer. I’m located just North of Tulsa in Bartlesville (which still is part of the 918). I work for an oil company during the day and enjoy the kitchen and the entertaining aspects that come with it in the evenings and on the weekends. I’m also lucky enough to get to hang out in Hillary’s kitchen a few times a year as well. I even made an appearance a few years ago on here while making pasta. So on to the pressing question on everyone’s mind, a pig roast? …Like a whole pig? In your backyard? Why and how would you ever do such a thing? Well, it all starts with an idea that my buddy Derek and I came up with about 2 years ago. Derek has some experience in the cooking industry before coming to the oil business (where we met). And after coming to a couple of events I hosted, we started to think big. This was my 3rd consecutive Memorial Day cookout and it’s becoming a great tradition. Last year, I handmade around 25lbs of sausage with a turnout of around 60 people. So how else to one-up myself — we thought it was time to do a whole hog. So what is needed in order for one to do this? That will be debated among pit masters for years to come, but I’m going to share what I did to make this work. 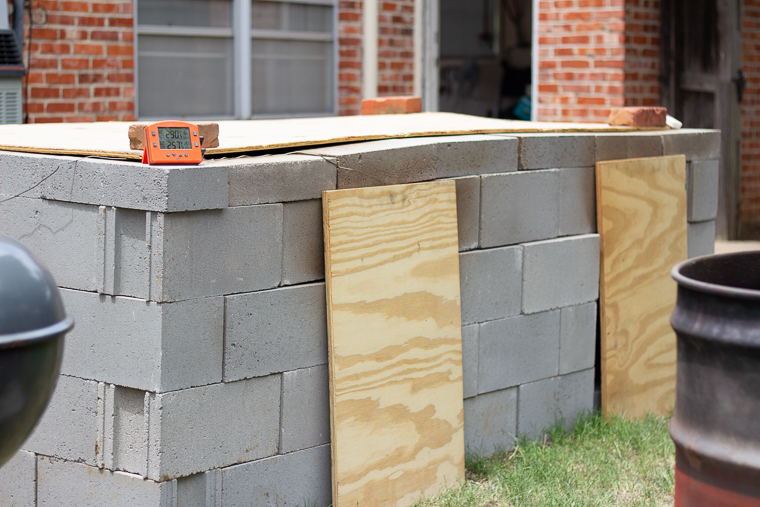 First of all, like most DIY projects, you have to be willing to not focus on the cost. There will always be hidden costs and supplies you didn’t think you needed or wanted. And then second, there are no bad ideas and it’s worth taking the time to reach out to those that have done similar projects and then formulate your own ideas based on other’s experiences. Designing the pit is the most important part of the whole process. 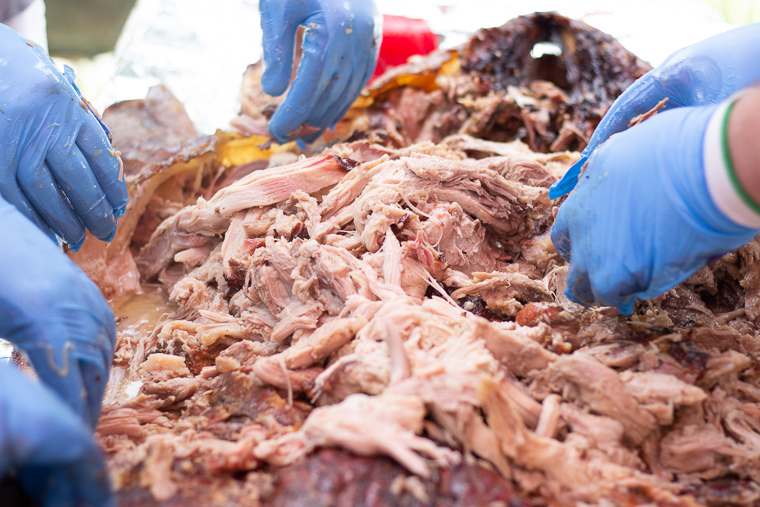 Many pitmasters have their opinions on what the proper way to do it is. Some think the best way is to do the pacific islander/Hawaiian way of burying the pig in a hole and using hot stones to cook the pig. Others feel that it needs to be on a rotisserie over an open fire. And finally, we come to the traditional above ground enclosed pit. 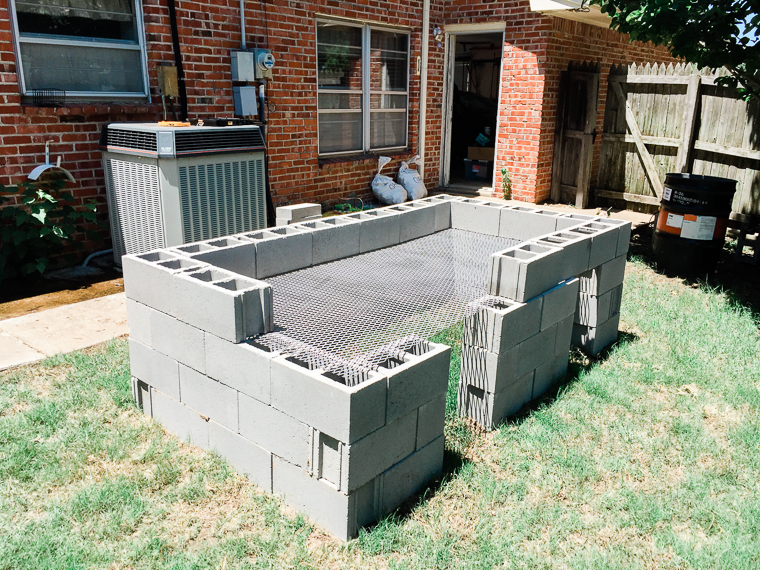 We decided to make ours a temporary pit out of cinder blocks. We used 64 cinderblocks, 4 half size, and 20 thin blocks for the top rim. We then used a 4×8 piece of ¾ inch expanded metal for the grate which we got from Oilfield Pipeline Supply up in Dewey. We have 2 doors on one side of the pit so we can feed in the hot coals throughout the cook as well as regulate the temperature. For a lid, we used a piece of plywood. For temperature monitoring, we used 2 monitors to measure the temperature in the pit. We used a ThermoWorks Smoke and a Maverick Remote Thermometer. We used a probe on each end of the pit to get the temp of the direct heat areas as well as one in the middle of the pit to get the indirect temperature. The fire is made up of a mixture of Pecan, Oak, and charcoal. The first thing we needed was a vessel to break down the wood into useable coals. 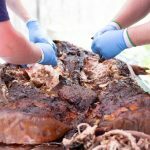 If fire was used in the pits, it would be difficult to control the temperature and the types of smoke that could be generated may negatively impact the flavor of the pig. The amount of moisture in the wood, the bark, and the fillers/materials used to make commercial charcoals can all affect the aroma and taste of the smoke. However, once all of it is burned down into a coal, the temperature regulation can be easily controlled and the aromas and tastes can be more expected. This is my burn barrel. 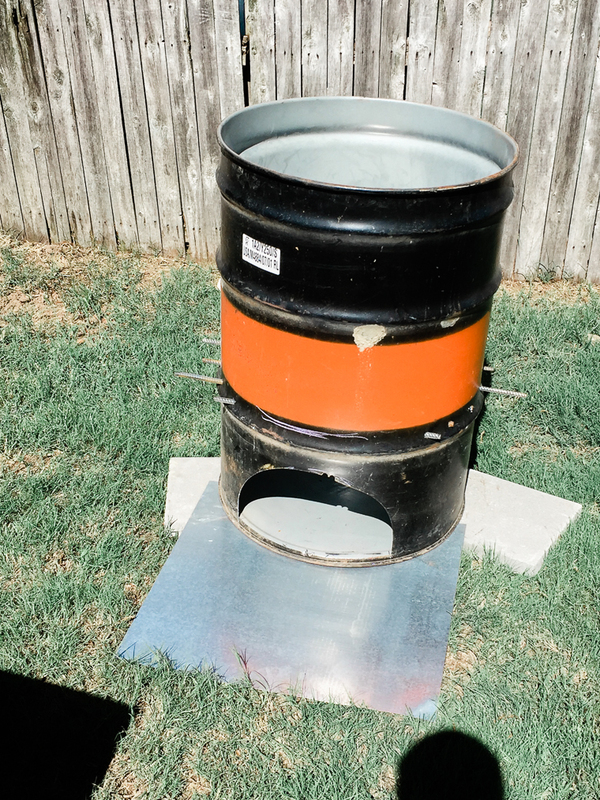 It is a 55 gallon drum that has a rebar grate built in 1/3 of the way from the bottom. This allows the coals to drop to the bottom. A hole is cut on the front of the barrel so that a shovel can scoop out the hot coals and be placed into the pit. 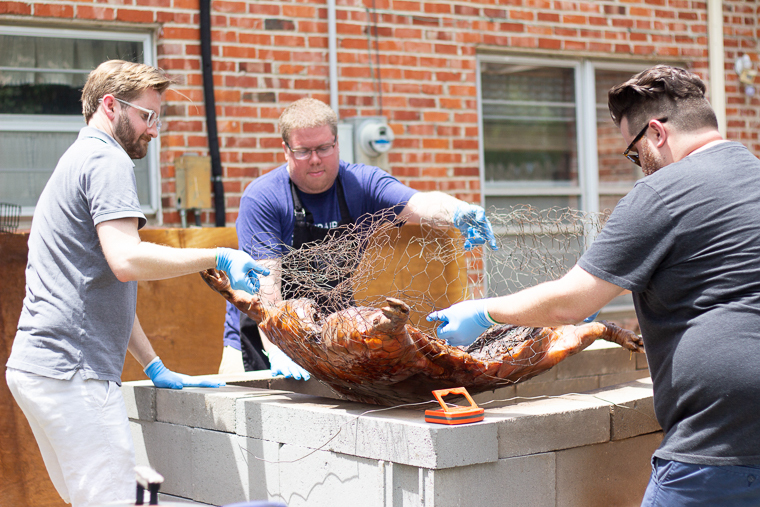 The pig we are cooking we got from Butcher Bros in Owasso (H: Local Spotlight!). She weighs in at 103lbs. The general rule of thumb is that from a 100lbs pig, you’ll get about 45lbs of eatable meat. You can also use the guidance of 1.75-2lbs of raw meat per person when cooking a pig. We requested that the breastbone be cut by the butcher before pickup in hopes that we wouldn’t need to do much more butchering. 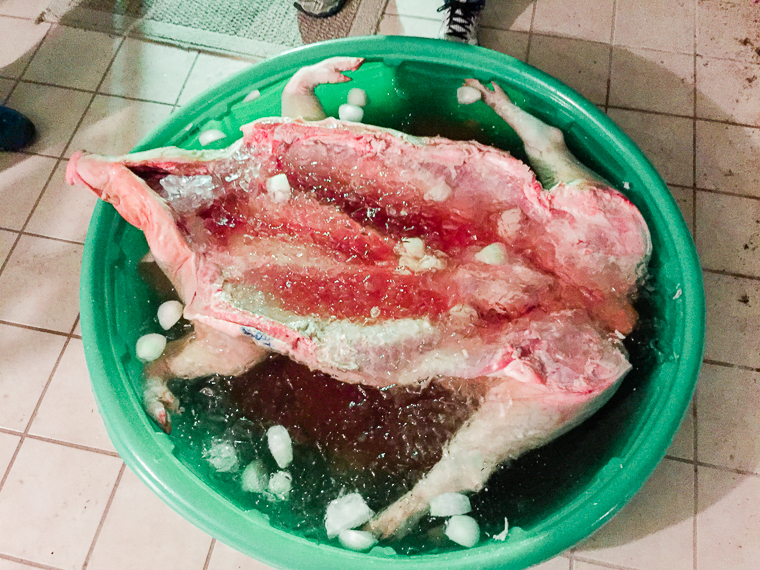 Once the pig was rinsed, we realized that the pelvis needed to be cut in order for us to open up the pig to lay flat. We also had to cut the spine in the half, something we knew we were going to have to do and wanted to do ourselves because we thought it would be too difficult to transport the pig without the support of backbone. To cut the pelvis, we had to use a hacksaw so the hips and the legs would lay flat. To split the spine, you have to take a sharp axe and hammer and split the spine down the entire back. The goal is to get to the pig to lay as flat as possible. 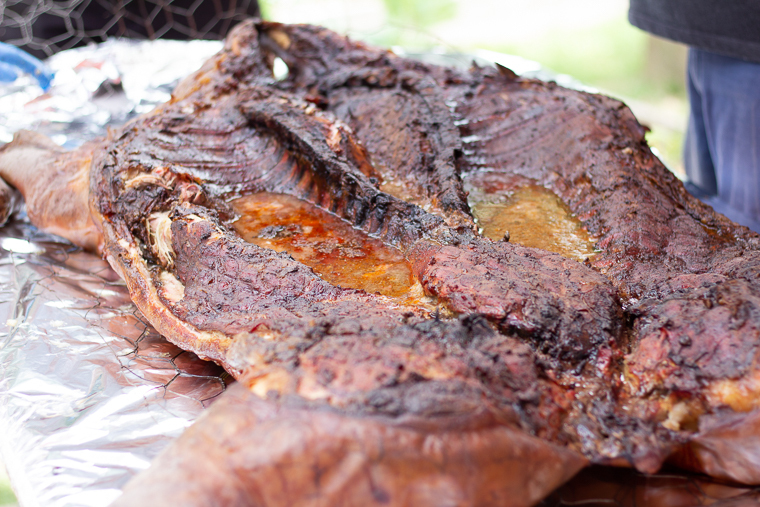 Next we remove the silver skin from the ribs and trim any extra fat off that will burn during the cooking process. That being said, you don’t want to trim off the delicious pork belly and bacon as well as keeping enough fat to keep the pig moist and flavorful for the full cook. A final rinse is given and the pig is moved to brine bath for 10-12 hours. The brining solution is about 5 gallons. In it, there is 1 gallon of apple cider vinegar, 2 cups of salt, and 1 cup of sugar, some onions, and water. That brine is then injected into the pig in the hams, shoulders, and belly. About 5 more gallons of water was added to the bath along with 80lbs of ice to keep it cool for the afternoon. About an hour before putting the pig on, we took it out of the bath and gave it a final rinse. Then we dried it off so we could season it. We started with a good ol’ yellow mustard rub. Then we added salt, pepper, and paprika. Then it’s time to add it to the pit. When cooking a pig, it’s all about low and slow. 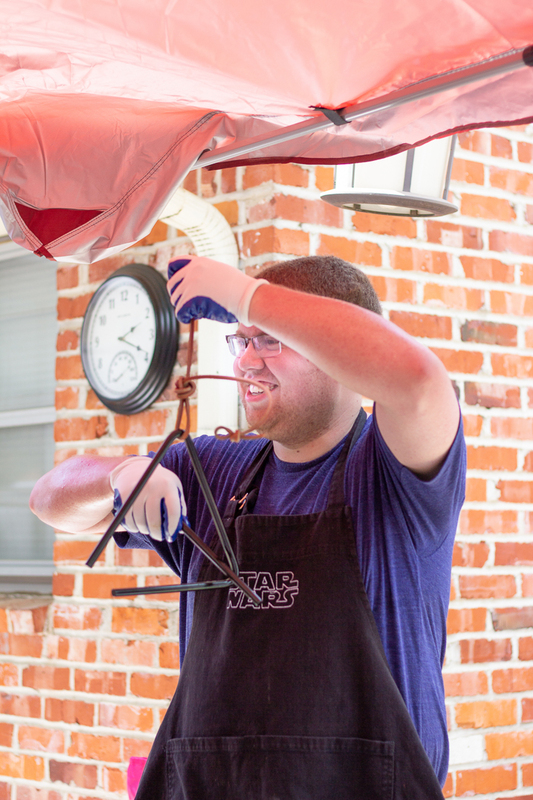 When we started, our goal was to cook the pig indirect at about 235° F and anticipated that it would take about 12 hours. 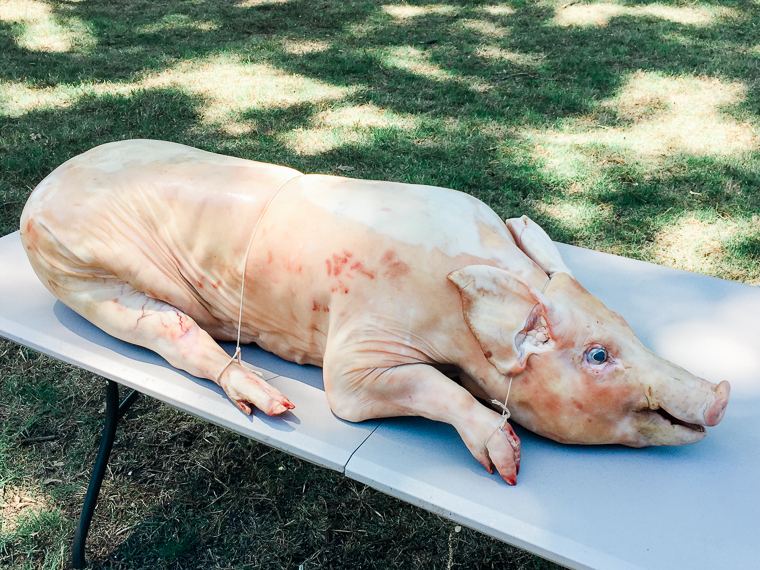 For indirect cooking, the coals were placed along the front and the back of the pit at a temperature around 250° F. To start the pig, it is laid meat side down (stomach) and cooked that way for 6 hours. Then at the anticipated halfway point, the pig was flipped over to its back. In order for 3 of us to successfully flip a 100lbs pig, there was a layer of chicken wire that was used support the pig during the flip and the move. The 2nd half of the cook took closer to 8 hours, making the whole cook time to be close to 14 hours. The shoulders and the belly don’t take as long to cook as compared to the hams and tenderloins. The hams and the tenderloins are also leaner pieces of meat, meaning that they could dry out if over such a long cook. Once the pig was on its back, we started to baste the pig. We used a solution of apple cider vinegar, Worcestershire sauce, tomato paste, hot sauce, crushed red peppers, salt, and pepper. 8 hours after the flip we pulled the pig off and prepped it for serving. Part of the intrigue about a whole pig is being able to serve yourself from the pig. We removed all the bones from the pig and pulled/shredded the pork and let everyone serve themselves. Rinse the pig from the butcher. Butcher further, if necessary for it to lay flat. Remove the silver skin from the ribs and trim any extra fat off that will burn during the cooking process. Give one more rinse and move the pig to the brine bath for 10-12 hours. Inject the brine also into the pig in the hams, shoulders, and belly. About an hour before putting the pig on, give it a final rinse and dry. Place the pig in the pit. 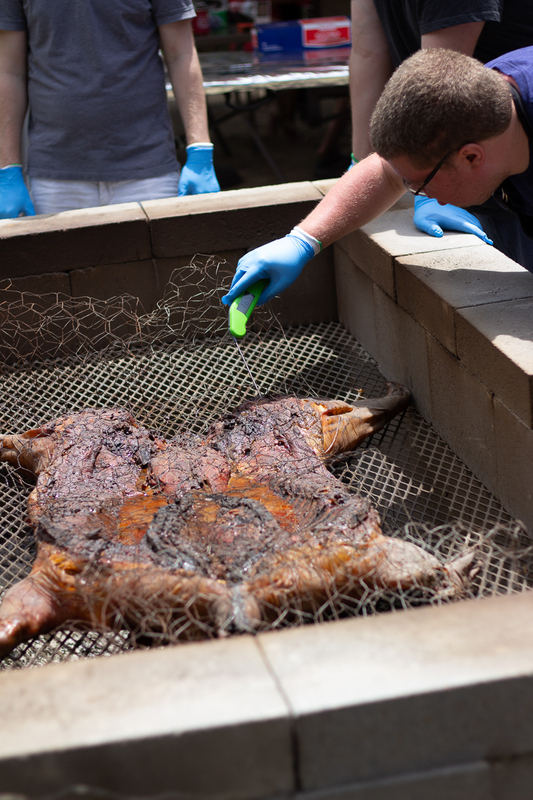 For indirect cooking, the coals were placed along the front and the back of the pit at a temperature around 250° F.
To start the pig, lay it meat side down (stomach) for 6 hours. 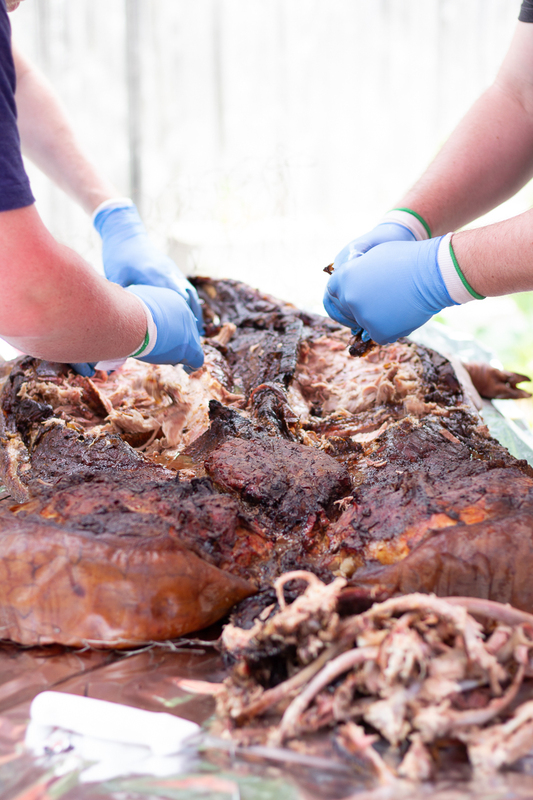 Then at the anticipated halfway point, flip the pig over to its back. Cook for another 6-8 hours. Baste the pig on the inside with a mixture of apple cider vinegar, Worcestershire sauce, tomato paste, hot sauce, crushed red peppers, salt, and pepper. Pull the pig off and prep it for serving. Remove bones and shred the pork inside. For more detailed notes, please see post. It’s me again. I gotta tell you – it’s as good as it looked. You can see all the pictures from the prep and event in our new Facebook Group, 918 Plate Community! Is this something that you think you could attempt? ?